So, I'm sharing a cheese board with the family while we're intermittently passing out candy to trick-or-treaters when The Wee Wonder takes a piece of goat Gouda and places it on top of a disc of dark chocolate. Nodding my head I try one. Well, of course it works. We start talking about what to do next and my brain screams "BREAD". As my brain is also prone to playing two verses of awful pop songs from the Eighties in a loop for days on end I decided to do a little more research. I'd heard of chocolate bread. I'd heard of cheese bread. Oddly enough, the two were one entry apart in the cook book included with my bread maker. So convenient. Taking the cheese from the onion and cheese bread and using it instead of chocolate chips in the chocolate bread recipe seemed like the way to go. I decided to stick with the goat Gouda as the cheese. After tweaking the cocoa powder and cheese portions a bit I put it all together in the maker and fired it up. Mistakes were made. For reasons I've yet to determine our bread did not rise. Peeking in periodically it was clear early on that it would not rise. I've made a lot of bread in that machine and the only problem I've had was with a loaf of rye when I hadn't used the freshest rye flour. 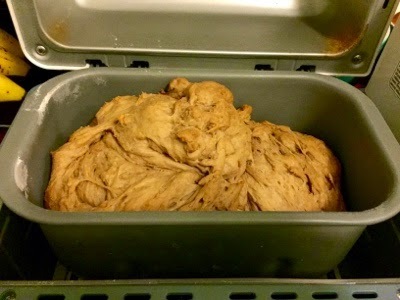 Realizing that it was too late to fix our chocolate and cheese loaf, I let the twisted lump bake. At the end of its three-and-one-half-hour cycle I unleashed the loaf and grabbed some butter just in case. It was good. It wasn't pretty, but it was good. I couldn't taste any strong notes of either the chocolate or the cheese but the combination made for some great tasting bread. While the butter wasn't needed to enjoy the bread it was welcome. Even the failure to rise had worked out as the bread was muffin-dense and not the brick that I'd feared, and while the rest of the loaf was loaf pan shaped, its twisted top lead me to dub it the Ween Loaf after one of my favorite albums. What went wrong? I can't put my finger on it. I'll figure it out eventually, I'm sure, but right now I'm just impressed with what went right. It's some seriously delicious bread. Here's the recipe with my tweaks. Adjust as needed for your own bread making method. Will I give it another go? Absolutely. Even if I can't get a proper risen loaf out of it the results were fantastic. My little cook has another winner to her credit. She's pleased. So's her dad. No members of Ween were involved in the making of this bread. Therefore, no members of Ween were hurt in the production of this bread. So there.